He started studying trombone in the municipal school of Caudete at age 7 with Mr. Vicente Asensi. 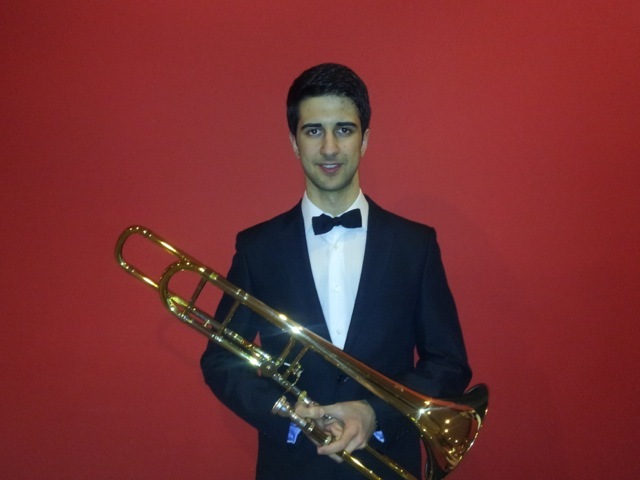 He moved to Conservatory “Jerónimo Meseguer” of Almansa later, in which he has studied from 1st to 4th year professional degree with Mr. Juan Carlos Igea, with a double major in trombone and euphonium, receiving tuition of honor at the trombone and orchestra subject in the last year. He moved to the municipal Conservatory “José Iturbi” Valencia in 2011, where he finished 5th and 6th professional degree, being his teacher on euphonium Mr. Juan Jesús Ortiz Cabanes and Mr. Carlos Gil Ferrer on trombone, with which continues receiving lessons today. Also since 2011 receives classes chamber music and orchestral conducting by Mr. Vicente F. Chuliá Ramiro. Since 2008 he is part of the Musical Union Band Sta. Cecilia Caudete in which he has performed as a soloist in various concerts. - Youth Orchestra of the “Generalitat Valenciana” (JOGV) since March 2012. - Component of the Youth Orchestra of the Region of Murcia (OJRM) since June 2012. - Guest in the National Youth Orchestra of Catalonia (JONC) since 2012. - Philharmonic Orchestra of the University of Valencia (OFUV) in 2012 and 2013. - Schleswig-Holstein Orchestra (SHMF) in 2013, 2014 and 2015. - Component of the National Youth Orchestra of Spain (JONDE) in 2014. - Selected by the Youth Orchestra of Holland (NJO) in 2014. - Accesit in Villena Young Performers Competition in 2009. - Finalis in Villena Young Performers Competition in 2010. - First prize in the Young Performers Competition “Rotglá i Corberá” in 2011. - First prize in the National Competition for Young Artists Xativa City in 2012. - Finalist in the National Competition for Young Performers Cuenca in 2012. - FIRST PRIZE AND HIGH SCORE in Competition for Tuba and Euphonium Villajoyosa in 2012. - First prize in the International Young Performers Competition “Ciutat de Lliria” in 2013. - Finalist in “Juventudes Musicales” Spain permanently Competition in 2013. - Professional Grade prize to the Conservatory “José Iturbi” of Valencia. - First prize Competition for Young Performers “Ruperto Chapi” de Villena in 2013. - Second prize in the IV National Competition for Young Performers Cuenca in 2014. - First prize in the First National Trombone Competition (organized by the Spanish Association of Trombone – ATE) in 2014. Since 2011 he is an active student of the “Aula de Trombón” under the tutelage of Carlos Gil and Indalecio Bonet. He has also completed several courses with teachers: Brand Attema, Bruno Flahou, Juan Real, Ricardo Casero, Ximo Vicedo, Ian Bousfield, Mark Hampson, Juan Carlos Matamoros, Michel Becquet and Gilles Milliere.